I'm translating a technical text and can't decide about wording. How do you call a metal box the dishwasher parts are in? The variants are "housing"/"body"/"case"/"frame". Not the "cabinet" - I don't need a wooden box for in-built models. Housing is about computers, isn't it? So what is the correct word? Thanks. Note that a frame can be made of any material. Able to be found in high or low temperature models, the Electronic Series from Jet-Tech consists of an especially efficient line of products. The SmartSelf diagnostics alerts help you keep track of maintenance throughout the years, and the OneGo LED Control System features soft-touch buttons and allows you to choose between three different cycle-types. Machines from the Electronic Series aren’t only full of useful properties; dishwasher models from this line have stainless steel chassis components and wash tank for additional longevity. 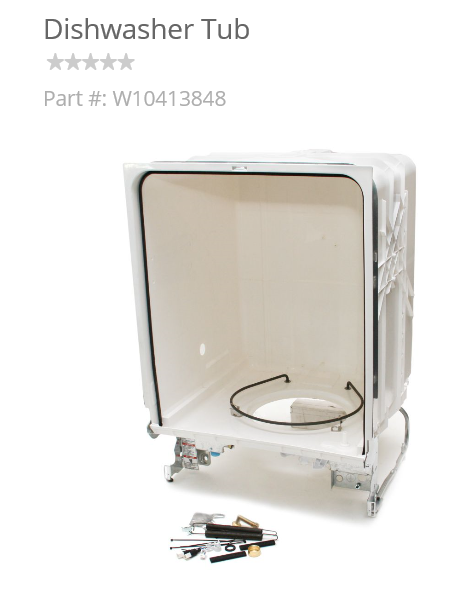 The chassis of an appliance may be considered to include the body panels or not. Body and housing are perfectly fine also. It really depends on your audience. For the home owner, I might go with housing. For high end commercial gear, I would make the distinction between chassis and body. If the picture below is what you are asking about, then it is called the dishwasher tub. You can Google this to get confirmation about its widespread use. Here is one example: SEARS Parts Direct. While some dishwashers are stand-alone and have an exterior cabinet that encloses the tub, the largest part of a cabinet-installed dishwasher would be the tub, with no structural enclosure outside of it. You can find more information about English terms for dishwasher parts by searching "dishwasher parts" and looking at the pictures from that search, along with their corresponding links for more details. That should lead you down a path that helps you out. Not the answer you're looking for? Browse other questions tagged single-word-requests word-choice technical or ask your own question. What are these parts of the cheeks or face called? What are the terms for the parts of a comparative? What does 'disk box' mean here? Is there a specific name for an intentionally trivial or flippant answer that is designed to elicit a necessary clarification in a question? What are the parts of an air ventilation system called?